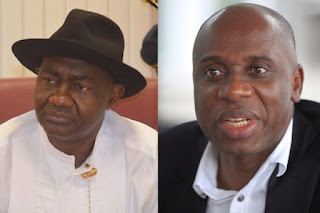 The Senator representing Rivers South-East District in the National Assembly, Magnus Abe, has finally revealed how his face-off with the leader of the All Progressives Congress, APC, in Rivers State, Chibuike Amaechi, started. Abe, in an interview with Vanguard over the weekend, said Amaechi had visited his Abuja residence to ask him to kill any hope of becoming the state governor under the APC come 2019. According to him, “The truth of the matter is that the Minister of Transportation, Rt Hon Chibuike Rotimi Amaechi came to my residence in Abuja on the 29th December, 2016, few weeks after the rerun elections for what I initially thought was a normal visit. “My entire family received him with much joy. After some chitchats, he asked to speak with me in the presence of my wife. He then disclosed that the real reason he came was that he had heard from two very important Nigerians that I was interested in running for the governorship of Rivers State in 2019, and he came to warn me not to dare it. “I told him no one had started running yet, because it was not yet time, but I pleaded with my friend to give everyone, including me and Dr Peterside a chance but he said no, that Peterside was out and that he could not consider me because I did not support Dr Peterside in 2015. “I was shocked to hear that and I told him then that those who were saying I did not support the party in 2015 would answer to God. I also told him that I had not taken a decision on the matter. Two things struck me from that visit. “If the party structure was set up for Dr Peterside it meant the decision to make Peterside the candidate was taken before the party structure was set up. “Secondly, if you knew I could not win the primaries why not just allow me fail honourably if I decide to contest. I think he was offended by my response because he called another meeting, this time with my elder brother, Dr Abe who has always been like a father to both of us in attendance with my wife and stated same position. “But I still insisted that I would say amen anywhere if anyone had said I would be governor. So, senator Uchendu knew about those meetings and he knew about Amaechi’s position.